Embarking on a home improvement project? We’re excited to hear it. Whether you spend your Tuesday evenings gawking over shiplap on Fixer-Upper or have never watched a second of HGTV in your life, it’s no secret that home improvement projects are a big undertaking. But, they don’t have to be as overwhelming as you might think. The “appmosphere” is full of DIY, design, and renovation apps that will help you curate and manage even the heftiest of home improvement projects. From color matching and paint previewing to room drawing and measurement taking, here are seven home improvement apps to help you kick off your project. Sure, this one is a little obvious, but it can’t be ignored. Pinterest allows users to create specially curated boards full of pictures, ideas, tips, and inspiration. This app is used for way more than just home improvement, but it has proven to be quite popular among homeowners looking to spruce up their space. 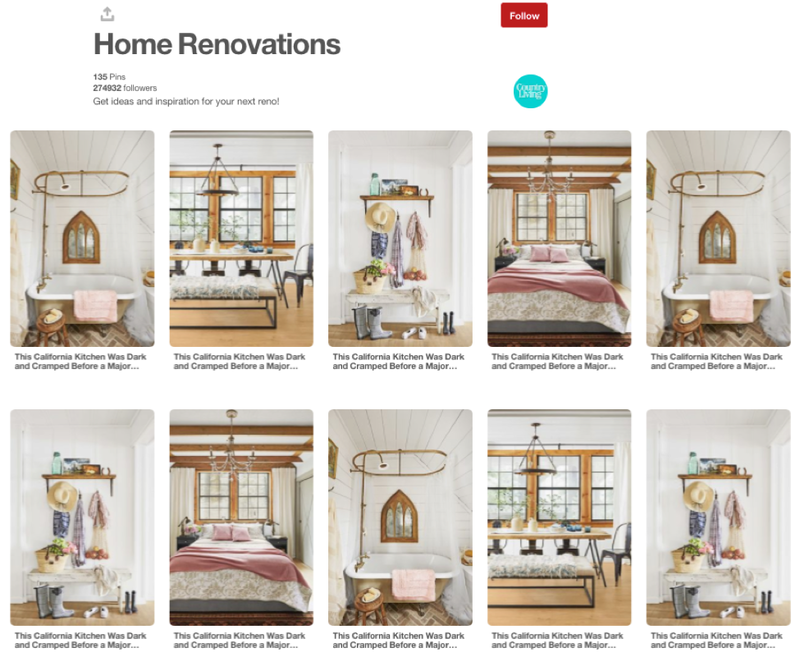 According to Pinterest Business, approximately 60% of users have leveraged the platform to make home decor purchases. Create a board for each room or project, share your own “before and after” shots, and connect with and follow other pinners whose ideas spark your own interest. Need some inspiration ASAP? Check out Country Living’s slew of home-related boards for up-cycling ideas, interior design trends, and entertaining tips. If you’re looking for an all-encompassing way to plan and design your home, look no further than Home Design 3D. This interior design application offers an intuitive interface, allowing you to conceptualize and draw floor plans, furnish and decorate, visit your creation in 3D, and share or import and export your designs. Some features require an upgrade, but the capabilities of this app are endless when it comes to viewing your renovation from all design angles. Imagine a very sophisticated and professional version of The Sims’ home building feature, sans the characters, right at your fingertips. Check out the latest projects shared by real users. Home Design 3D even chooses a “Best Designer of the Week” and will share your projects on their social media platforms. If you’ve ever found yourself spending hours perusing swatches in the paint aisle of your nearest home improvement store, you’re among the many people who are indecisive when it comes to choosing paint colors. We completely understand. Even though it may seem as easy as painting right over it, by the time you get the rollers, brushes, primer, and paint, the bill – and time commitment – can add up. Plus, the colors you put in your home are a big deal. Some hues have even proven to increase the value of a home. According to Time, homes with bathrooms painted lighter shades of powder blue or periwinkle increased the home’s value of $5,440, on average. That’s where TapPainter comes in. This app is one of the top paint color visualizers for home interiors in the industry. Choose and mix paint from a color wheel and then upload a photograph of your room. Not only does the app take natural lighting conditions into account, but it also allows you to access real paint color codes from top brands when you upgrade to the standard version. Painting your home from the comfort of your own couch before you even lift a paintbrush sounds pretty cool. Raise your hand if you’ve gone to a furniture store to pick out your next staple piece, only to realize you don’t know the measurements of the space you’re trying to fill. This app will help you avoid that. Photo Measures lets users add measurements directly to their own photos. You can zoom in or magnify an area of the room, draw your measures, and export and sync your documents with your DropBox account. It costs $6.99 on iOS and $4.99 on Android, but the cost seems worth it if it’s saving you trips back home. When it comes to DIY organization and planning, this home improvement app reigns supreme. Created by the team at Curbed, Handymobi helps users organize and share DIY projects and ideas. Choose from a wide range of in-app digital tools, including a level tool, calculator, and unit converter. Becoming a Handymobi user instantly puts you in touch with a community of DIY fanatics who can help you plan, budget, and build your projects. Whether you’re a seasoned guru or new to the DIY community, this home improvement app will surely make your project more manageable. Your home is one of your largest assets, and a lot goes into managing it. HomeZada is home management software that helps you organize everything from maintenance needs to insurance claims. Features include a 3-year home value forecast, home asset inventory library, home maintenance scheduler, and a home improvement project tracker, to name a few. This app views your home holistically, addressing aesthetics, financials, and logistics. Let us help you make your home beautiful. Some home improvement projects just can’t be DIY’ed. Whether you’re in need of a roof replacement, energy efficient windows, new siding, or a secure front door, we’re here to help. Contact Long Roofing at 844-602-LONG or visit us online to request an estimate. We build trust and peace of mind into every Long product.